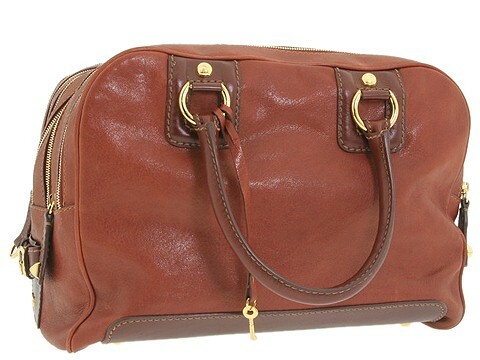 Travel around town in style with this luxuriously chic satchel by D&G. Made of sumptuous leather. Holds your wallet, sunglasses, personal technology and a small cosmetic case. Dimensions: 14 wide across the bottom x 10 deep x 10 high. ; Dual handles. Handle drop: 6 1/2 length. Protective dust bag included. Studded accents. Lock and key accent. O-ring details. Seven-compartment construction; Striking satin interior lining with a back wall zip pocket.